Earth is under attack by Aliens, and none of its defencive maneuvers are any match for the superior alien technology. The kingdom of Kothakpur and Pehelwanpur are attacked and reduced to rubble. Dholakpur too suffers a similar fate. The king of Dholakpur, Induverma, and the princess Indumati, are abducted by the aliens. 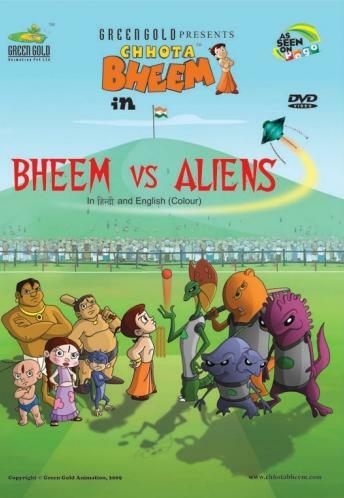 Bheem and his friends are playing a Twenty-20 cricket match against their rival team lead by Kichak from Pehelwanpur. Bheem's team scores 115/2 from 20 overs, aided by a strong innings from their skipper Bheem. In return, Kichak's team scores 109/4; with 6 runs needed to even the scores. Kichak hits a lofty shot in the air, but before the ball could land, it is destroyed by a laser beam from an alien vessel. The aliens continue their rampage, setting a majority the nearby huts and trees on fire. Instead of fleeing, Bheem decides to confront them, and call them out. The leader of the aliens, Kyto reveals that they are from the planet Zekan, and they have come to take control over earth. On Bheem's persution, he decides to give earth a chance. Kyto says that the following day, they would have a competition- Bheem and his friends would have to face the aliens in a game of 'Plutocket', where if Team Prithvi (earth) wins, the aliens would leave their planet alone. However, if the Zekans win, earth would be theirs forever. Bheem and his friends are joined by Kichak's team, but they are now faced with a major problem- they have no idea about how the game Plutocket is played. One of Kichak's friends, Motu, informs that the aliens are practicing nearby. On spying on their practice, Bheem and his friends learn that Plutocket is actually what the Zekans refer to cricket. Team earth might actually stand a chance. Team earth is formed; Bheem, Raju, Kichak, Kalia, Dholu, Bholu, Jaggu, Chutki, Manna, Motu, and Poptya are selected as the final eleven. The day of the match has arrived, and the arriving aliens are confronted by team earth. Team earth wins the toss and chooses to bat. With Bheem leading from the front, and fueled contributions from Kichak and Chutki, they manage to put 117 runs on the board after 20 overs, at the loss of 9 wickets. Team Zekan's batting starts strongly, with their openers Liska and Peptik troubling earth's bowlers with their weird batting styles. Bheem observes that each of the aliens have some definite characteristic, which they can take advantage of. Shortly thereafter, they bounce back in the game and manage to send a handful of Zekanians like Bagel, Puro, and Dilo back into the pavillion. However, Kyto remains not out, and continues to fight through his innings, completing his half century. At the end of 19 overs, Zekans are at 102, requiring 16 runs off the last over. They hit a six off the first ball to ease the pressure, but team earth manages to hold them within the walls. With 6 runs required off the last ball to win the match, having 1 wicket in hand, Kyto hits the balls high in the air. Dholu and Bholu are the fielders running towards the ball, and on the verge of colliding with each other. Suprisingly, they pull off an exceptional double team move to take the catch and dismiss Kyto, thus winning the match for their team and their planet. According to the deal, Kyto has to set free the king and the princess, and leave earth in peace. King Induverma and Kyto agree upon peace relations between the two planets in the future. The next day, Kalia is shown bragging to Dholu and Bholu about the aliens, saying some of them are not so bad after all. Jaggu drops from the tree wearing an alien mask and asks ''What do you think about me? '', which is enough to have the three running on their heels. Bheem and his friends have laugh at the sight, as the film comes to an end. Reviews for the movie was generally positive. It helped establish the Chhota Bheem movie series' popularity over other animated movies from India.